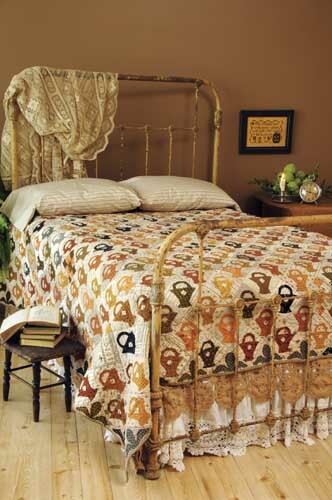 The basket quilt is found in When the Cold Wind Blows published by the Kansas City Star Quilts. 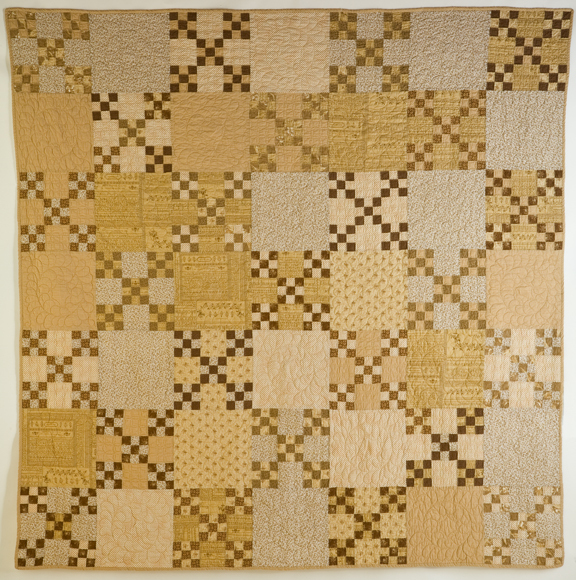 Next Barb thought she would make a quilt of 25 blocks. Twenty five large blocks would be so much easier than 291 blocks....but it still has 125 small 4-patch blocks. The Irish Chain quilt is in our Weekend book. How can you use small 6" blocks without making 291 of them? Make a table runner. Piece 6 blocks, add some setting triangles and a border and you're done. For our block pattern click here. Our table runner directions will follow next Tuesday. Jeanne Zyck quilted this for me last night. Just finished the binding. (Talk about sliding in for the finish!!!) Thank goodness for Jeanne. The prize is pictured below. Leave a comment and we will select one person to get the three Jelly Rolls. One each from some of our favorite fabric lines. The contest ends on the 16th. and we will announce a winner then. Good luck to all. The blog hop is almost done. Here are the remainder of designers you don't want to miss. The fabric is so yummy! Thanks for the giveaway. All the quilts are beautiful and the jelly roll colors are just lovely. I'd give them to my mom, who at 76 years young is wanting to learn to quilt! She's a great sewer but has never really quilted. I think she'd love it and it would help keep her mind occupied. Thanks for another wonderful opportunity! I so love our fabrics and I'm currently working on your basket quilt, but making mine out of red fabrics. I always look forward to your new fabric lines and books. The books combine the best of both works - quilting and stitching!! I think a few of us have slid under the wire with a binding. Being a love of all hues of blue - just love the Nature's Basket! Absolutely love the sweet blues. What a beautiful basket quilt...pure labor of love. Thanks for the ideas for small blocks look forward to your table runner pattern. I really like the block. The tablerunner is soo pretty. What a finish! I would love to win the fabric. Its just so beautiful! I always look forward to seeing your new fabric collections and books. Thanks for so many wonderful patterns. I waited patiently for your turn! I have not been disappointed. I love all your designs. I am still working on Birds of a Feather and it will be so beautiful when finished. Thanks for the block and future directions for table runner. Thanks also for the chance to win. OOOH, I love that table runner! And the basket quilt is on my bucket list! I love those blues and creams together. Thanks for the block and the chance to win those scrumptious jelly rolls! 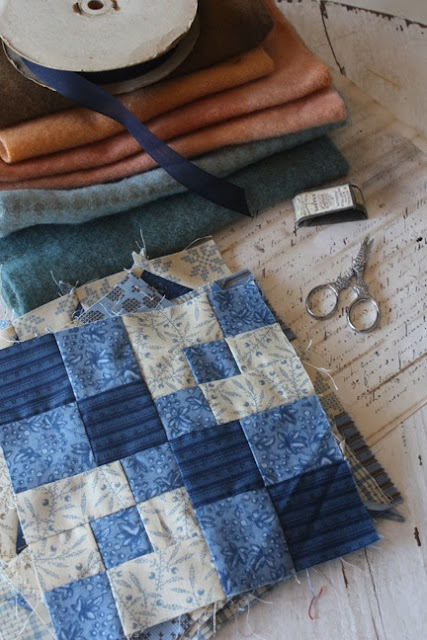 Love the block, beautiful blue fabrics! Beautiful table runner! I love Barb's basket quilt too. Beautiful as always. Thanks for sharing your ideas. OH thank you! I love blue and white...I can't wait to start making all these wonderful blocks and setting them together. It would be awesome to have your fabric line to do it with! Have a blessed day! Oh these are beautiful jelly rolls!!! Thanks for a chance at them. I do love the table runner-I am a want it now kind of person so a table runner finishes faster than a quilt :) That basket quilt is gorgeous! Double Nine Patch is my all-time favorite pattern, and I love the one pictured in this post. Those jelly rolls would keep me busy and in double-nine-patch heaven! I love making small blocks so I know this dilemma well. 3 jelly rolls - Wow what a prize - thanks for the chance! Beautiful quilts! I do runners and smaller quilts. Can change out with the seasons! Love the scalloped border on the runner! Nice touch that adds that extra bit! Oh my 3 jellys to one person! I am giddy!!! Love that table runner! And I whenever I see a pattern calling for over 200 blocks...I'm out. I just don't have time like that. Maybe when my kids are grown.... Thanks for the giveaway! I love your block and what beautiful colors and fabrics in those jelly roles. Thanks for a gorgeous giveaway! Wilma Rutten from the Netherlands. Blue and white is such a great color group love the runner and thank you for the giveaway. Those baskets are so cute! I'm not sure about making 200 though..thanks for the giveaway! inspiration love the table runner. What a cute table runner. I would love a chance to win the jelly rolls. Love the blues and creams! I thought this fabric line would look great for my Farmer's Wife quilt that I want to start soon! Thanks for the chance to win!! I would never have the patience to make almost 300 baskets~! Beautiful quilts. Thank you for the chance to win the jelly rolls. I hate when that happens! That's why I don't do small! Beautiful quilts though! A basket quilt is on my bucket list. Love what you did with your block and I LOOVVVVVVVVVVVVE your fabrics! I can't wait to see your post on Tuesday. I have a runner addiction ! Wonderful runner and the baskets quilt is fabulous! !.Thanks for the giveaway! thank you for the opportunity to win such beautiful fabrics! Love your designs and quilts!! Love your quilts. The basket quilt is awesome but don't think I would have the dexterity to make 300 blocks, it would take me a lifetime. Thanks for a chance to win your wonderful fabric. I love making small blocks, but you're right, they sure don't add up very fast. Thanks for sharing your beautiful tablerunner. I love small but don't care for large numbers, but boy do they look great when completed! I'm going out to get When the cold wind blows because that basket quilt is stunning all 291 baskets! Thanks for persevering and giving us some wonderful patterns! Your table runner is beautiful, as are your fabrics! Your block looks fabulous in those blues. I'm quite sure I would never have the patience to complete a quilt with so many small pieces. This hop has been really fun. I love all your designs, both fabric & quilts. I love 9 patch quilts. Thank you for the giveaway. I had to laugh when I read about the basket blocks....I've done that! Beautiful table runner and what a awesome giveaway! I'd like to follow your blog by email but could not find a link to follow. I do love small, but large is also great. Your quilts are beautiful, but your fabric is wonderful. Natures Basket has endless options as to quilts it can be used for. I also use your embroidery patterns, and thank you for being so talented, and bringing it to print for the use of us quilters and stitchers. My local quilt shop always has your latest books and patterns, and wonderful selections.Looking forward to pattern for table runner. I love the primitive look. Very nice. Thanks for the chance to win. Three jelly rolls! Eek! What a great prize. Thanks for the block pattern and a chance to win a most generous prize! Love the blue colorway. Wahoo! Scrumptious! Thank you so very much for this giveaway. Ideas are rolling through my head already for this gorgeous fabric. I made the basket quilt. I love it and have often thought I would make another one. The 9 patch in the weekend book is open in my quilt room. It is calling me. yes, I love your quilts. Thank you for the chance to win..
Love small! I probably have more of your books than any other author. Yuou always cheer me up andlet me dream. I have your book with the basket quilt. The quilt is also on my to-do list. I love the blue and white table runner. But then blue is my favorite color. Thank you for the giveaway. I am enjoying the blog hop. There are so many ideas of what to do with the blocks. Just wow. I just finished a sampler quilt using your Beach House line and bordered it with a small floral print from At Waters Edge, finally! Thanks for the block and the giveaway. I love the blue table runner! 3 jelly rolls, be still my heart. Love those fabrics! Oh Yes, the basket quilt took some time - but it was absolutely worth it!!! 3 (THREE) jelly rolls - what a treat!! Love the runner, huge fan of blue. Love the blue table runner. Blues and greens are my favorite. Thank you for the chance to win the jelly rolls. Love the colors. Your table runner is cute, especially done in blue, which happens to be my favorite color. Thank you for the giveaway! I LOVE all of these quilts - and tiny blocks are the best (even if you do have to make a zillion of them)! Thanks for a chance to win, I love your fabrics and books. Oh, I just love that table runner! Beautiful pattern, and in my favorite color!!! Such a great giveaway. thanks for the chance to win. I love the small blocks too but it does wear on you after awhile.....that it when I set it aside on start on something else for awhile....Thanks for the chance to win!! Love the blue fabric--my favorite color. I have several quilts of my Grandmother's and the pieces are so tiny because they used leftover scraps and old shirts, etc. Nothing went to waist. I can't imagine the patients she must have had. I suppose several worked on it together but still! And by hand no less! I too am learning patience with a full size quilt with small blocks but I know it will all be worth it when it is finished. Thank you for the opportunity to win some of your beautiful fabric. I also love working with small quilt squares. I started working on those little baskets a while ago and I just might make a wall hanging or lap quilt. Love the basket quilt - maybe a mini quilt for me. Enjoyed your post and your blog. Thanks for the block and the giveaway! The basket quilt is adorable. Beautiful fabric and I love that table runner! 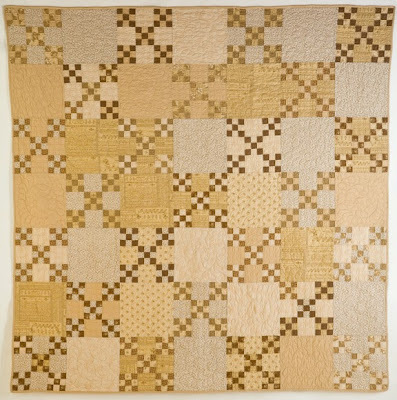 Excellent lesson on small pieces and how it so many to make a quilt. Thankyou for the block pattern and a chance to win. Love your table runner. The fabric is beautiful. Thanks for sharing. I love the small blocks and the fabric for the table runner. Close to 300 blocks-uh, no! Table runner yes. Love your give away! Love the baskets. Thanks for the generous giveaway. I know what you mean about small quilt squares! But the quilts look great! Thanks for the giveaway. Beautiful! I would love to win this giveaway. Love the table runner and all of your fabrics! Love, love, love Jelly Rolls. I'm planning a quilt for a church raffle and Jelly Rolls would be a perfect place to start. Please enter me in the drawing. Very cute quilts! Love the block. Thanks for the giveaway. I love bigger blocks. they help me get some quilts done faster. Thank you for the block and a chance to win. I love, love your fabrics as well as your cross stitch designs! The quilts are great too! Oh I want to make this table runner for my dining table out of Christmas prints for the Holidays!!! Thanks for sharing!! Love the block. So versatile. Your book When the Cold Wind Blows is one of my favorites. Keep up the great work. Such a generous giveaway! Could I be so lucky???? OMGosh!! Such a wonderful give away!! Thank you SEW much for a chance to win it!! Also love the block!! I love the basket quilt, I started on it shortly after the book came out. Unfortunately, I haven't got very far! Love all your fabrics and books. Thanks for the giveaway. I love your quilts, and I'd love to win these jelly rolls. I've just cut out the fabrics for 16 3-inch stars, and even that is daunting. I can't imagine making 291 baskets. (However, I have a longstanding UFO. I've handstitched 49 grandmother flower garden hexies, out to 4 rows, and discovered that I need to make about a dozen more for the size to work.... may be a 2014 project. Love your block and especially your use of fabric and color. It is so fun to see the different personalities. Thank you! Thanks for the pattern. Love the collection of fabrics in this group. Especially like the scalloped border on the tablerunner! I love to decorate with table runners, so I'm looking forward to the pattern. Your fabric designs "speak" to the romantic side of my soul and I enjoy using them. Thanks for the opportunity to win some fabric and thanks for participating in the blog hop. blue and white are so lovely together. I love sampler quilts, but they're a lot of work if you're doing big quilts, I agree. I like your idea of table runners with samplers; it feels so much more manageable, and you could pick colors and fabrics to match seasons. This has been a great blog hop with so many good ideas. Thanks for sharing! What a wonderful accent on the border of your table runner. And what a great giveaway. Your fabrics are so pretty! I really like the tablerunner too! Thanks for the give away. Thanks for that lovely post today. And for the blue and white fabric line. I look forward to your next book. I just did something similar, making a quilt for my grandma. I made 16 large blocks and thought, okay, done now, right?...nope. I'll have to make at least 10 more blocks! Haha, live and learn! Thanks for the giveaway. Oh how I love jelly rolls. And that table runner is so pretty. I love the blue/white table runner! I know the feeling of thinking you are almost done with the blocks.... and then discovering that you need more! Yes, the small blocks are cute but it does take a lot more of them to make a bed size quilt. It was so fun to see that basket quilt. Believe it or not I'm in the process of making those basket blocks. Love your books and fabrics, cross stitch patterns, the whole nine yards. You two are favorites of mine. You're so right on those small blocks that I adore! I've made your basket block from Cold Wind (the reason I bought the book!) -- I love the blue fabric! But I love all of your fabrics and I have quite a lot in my stash! Thanks for the chance to win. I'd be delighted!! Would love to win your beautiful give away! Thank you. I have always loved the basket quilt and have made a few blocks but have a very long way to go! I love the blue and white table runner--it looks so fresh! Thanks for the giveaway. Little blocks are cute, and thank goodness they make decent little quilts as well as awesome bed size quilts. Have fun! Thank you for sharing with us Alma, I completely understand with the using small blocks because they ARE so sweet, but heavens they take forever! My husband reminded me that "quilts are supposed to take years to complete" and I just laughed. Have a happy day! Blue is sooo restful and your block pattern on point makes a great table runner. 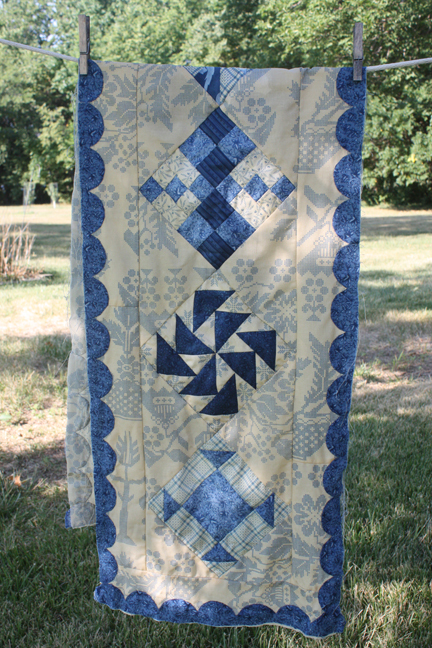 The scalloped border and quilting brings it all up another level of loveliness. What a great prize; thanks for the chance to win it! I wondered, when I saw the last few days, all the little blocks you were making, whether you were making a whole quilt! My best friend was making that basket quilt when she died. Her DIL is finishing it. A LOT of baskets, but so cute. I often forget to pay attention to the total number of blocks required in a quilt pattern. I get caught up in how much I like the design, buy the fabric and then it dawns on me as I am cutting hundreds of pieces that maybe I should have looked at the pattern a little closer. haha...Thanks for the fun giveaway! Love the table runner! I have been looking for a good pattern for a Christmas present and this is it! Thanks for the chance to win! Thanks for sharing your pattern. I ike the block a lot. Thanks for the chance to win the jelly rolls. I can definitely commiserate on the basket quilt. I am making Trick or Treat right now. It's what I call my long term project. I went into it knowing I would not be finishing it anytime soon. LOL! BTW: Love your new book Tending the Garden. I have the main quilt on my "must make" list and I pull the book out all the time just to 'plan' on my strategy. Very nice...runners are just my size kind of project! Love Nature's Basket and your table runner is just lovely. I love that table runner.It is beautiful and what a great idea if your not into making large quilts. (like me)Thanks for the great give away. I love the blue and white and also your block, thanks!! Loooove the blue table runner! Love all the patterns, just beautiful. would be proud to win. Good luck to all. Gorgeous! I'm thinking those blues would look really great in my mother's Currier & Ives kitchen/dining room. Table runners, placemats, maybe a wall quilt. Lovely! I so love your fabrics and quilt books. I'm also in love with all of your cross stitch designs. I would be delighted to win these fabulous Jelly Rolls. Thanks for the opportunity!! The shades of Blue that you use are awesome. The block looks good done in the blues. That blueberry one is just fabulous! Wow! What a gift! thanks for the chance to win. Small blocks do look cute but needing so many can put me off, which is why I often do lots of smaller projects like runners (maybe I am just lazy). Thanks for sharing the block and the great giveaway too. Great post. Great block. Thanks for this chance for some of your wonderful fabric. Love your fabrics! I like the table runner idea. Thanks for the great giveaway! I have found myself in that same quandary of thinking something looks easy and finding out it is much more involved than I thought so I end up making lots of runners or even hot pads. I love your fabric choices and am happy to have a chance to win. The quilts are lovely, but I just LOVE, LOVE that table runner! It's gorgeous. I would be thrilled to be a lucky winner, and I thank you for the chance to enter. Love the block. I'm thinking of making placemats using small blocks. Thanks for the giveaway! The scalloped border on your new table runner is yummy. 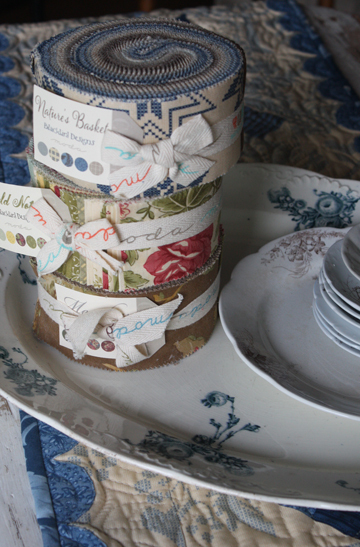 Thanks for a lovely giveaway - I've never worked with a jelly roll before and it would be fun to give it a try. Anne M - love the sampler block runner - it would be fun to do a whole quilt using all the blog hop blocks in various sizes. Thanks for the inspiration and I can always use more of your gorgeous fabrics!!! I am now making simpler quilts and letting the fabric speak. I do like to make table runners - the size is perfect to finish in a weekend. Thanks for the give away! I'm sure Barb was really disappointed when she realized she was barely started with her basket quilt. :( Love the blues and beiges in your other examples. Great fabrics. Beautiful quilts and fabrics. Thanks for the chance to win. Those jelly rolls are gorgeous!!! Small blocks don't equal quick or easy! I have all your books and much of your fabric. I'd love to win these! I like to make small projects for a quick finish in between sewing the bigger quilts. You can never have too many table runners! Thanks for the giveaway. Love the table runner and thank you for the opportunity to win some beautiful fabric!! 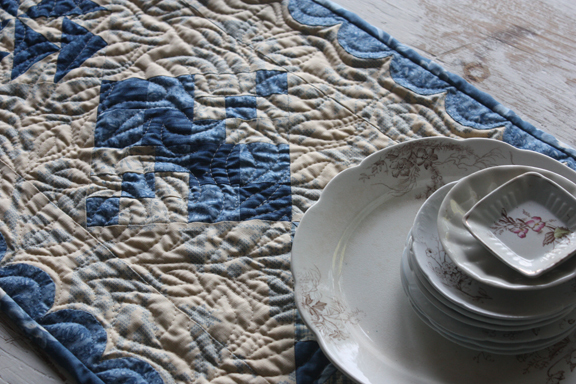 I love all the blues in the table runner. I've never made a table runner, but yours looks so lovely with the blues that I may have been inspired to try one. Perhaps something for Halloween. Wow!! 291 blocks!!! I can't imagine!!! The result was is quite pretty! Thank you so much for the chance at this very generous giveaway of gorgeous fabric!! Really like your scallop border on the table runner! Also I have to tell you how much I like your stocking kit "Never Far Away". Gorgeous fabrics and table runner that you made. Really nice quilts! Love the fabric. Can't wait to make the table runner. I just love your wool fabric line they make the most beauitful quilts.I would love to win some. I’m just amazed at the size of quilters hearts they are so big and willing to help others and the honest people you ever want to meet. I love the blues and browns in the fabric so pretty! Love the blocks in the table runner. Looks like something I could make and finishing. The fabric is so pretty. Thanks for sharing. I've been thinking about the basket quilt since I first got that book. If I win the fabrics, I'll have a really good variety to actually make it. Quilts with a ton of blocks are usually the prettiest! Love the fabric. Thank you for the chance to win a great prixe! Beautiful, beautiful quilts. I would love to make that basket quilt, but I know I will never 291 blocks of anything! Thanks for the chance to win the jelly rolls. Love the table runner! It is so beautiful. The basket quilt is so cute!!! Thanks for the inspirations and for taking the time to blog for us. I just love the information it's like being your friend and get to talk to you almost every day. I'm a lover of your blues and taupes, so would be sooooo excited to have some of your fabrics. The blue runner is lovely! Thanks for the block and the giveaway! Wow 291 little baskets! I'm so impressed. I started a Cathedral Window quilt years ago with little 2" windows - all by hand - I will never make it to bed size but maybe a good sized wall hanging one day . . . Thanks for the chance at the giveaway! 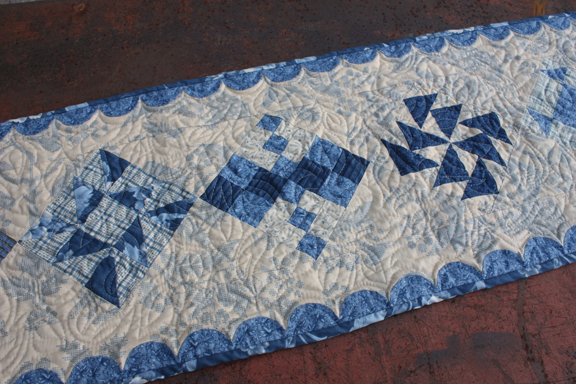 I love how the blues and whites look together, it reminds me of our first bed quilt. It was made with English linens and had a similar floral pattern. The basket quilt is so cute definitly worth the work. And I love the table runner, too. I always love the blues! I just love the restful nature of your fabrics. Great to sleep under. thanks. I love fabric so I'd be saying the same thing about each little basket "see how cute, oh I love this one" BUT I'd also say "What I have to make 200+ more of these little suckers" It would have been a pretty little table topper. Love your fabric giveaway....my colors!! You are 2 very talented women! I love your little block. I like all those little pieces (torture), especially when they are all put together. Thanks! O what a very beautifull fabrics I see. But I always love your fabrics and cross stitch patterns they are all jummy. I would love to make the table runner with those beautiful fabrics! Great job! And the basket quilt is a stunner! What a lovely block with lovely fabrics. Thanks for the chance! I don't mind how long it takes to make one of your quilts........the process is a joy.....and so is the result. :) I would love the jelly rolls. I love the curved look border on the runner. Was that appliqued or is that one of the fabrics in the new line? Love the basket quilt, and that border on the table runner is stunning. Thanks for sharing such beautiful quilts. Wow! What a giveaway! Someone's going to be very lucky! Love your block and how you use it. Wow that's a lot of little basket blocks to make! It is cute though! LOL! Beautiful blue block! Love it! I LOVE your pretty blue block! Thank you for sharing. The quilts are beautiful. Thank you for the wonderful giveaway! I would love to enter. Not 1 but 3 jelly rolls. Looks like one of us is going to be quilting her little heart out very soon. Love your block. Can't wait to make the table runner next Tuesday. Thank you for being a part of the Size Matters Blog Hop. Love your fabric and it would be a lucky Friday the 13th if I won it. Always love your fabric collections.